Drop In style Dispensers are designed to drop into a hole cut into counter top or be installed into a freestanding cabinet. Drop Ins are for Employee crew serve only due to the open ice bin. The Ice bin is used for storing ice that is used for filling the drink cups and well as cooling the products that run through the cold plate that is built into the dispenser. Most Standard Drop Ins are available in 15″ wide, 23″ wide and 30″ wide dispensers Available with a variety of a different type Valves 24 VAC electrical system supplied using 115 volt transformer / 60 Hz. Ice bins of Drop In are available in different capacities as well, 60 lb., 100 lb., and 130 lb. Cold Carb, Bevariety, Drop ins are also available which can have MVU valves and flavor shots. 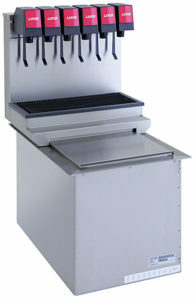 Drop ins are the preferred low cost high volume dispenser. 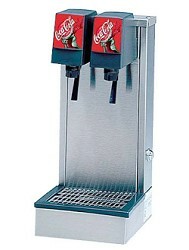 The Great American Beverage Co. has installed 1,000’s of these type dispensers for fast food restaurants, theaters, amusement parks and stadiums. 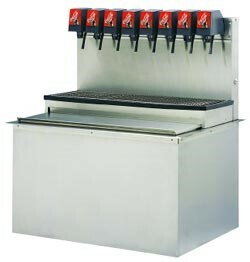 Drop in Ice bins or separate under counter ice bins can have a separate Dispensing tower installed with in a few feet of dispenser to serve sodas as well. Separate individual Towers come in numerous configurations from 1 valve to as many as you would like. Towers are used for dispensing carbonated & non-carbonated beverages or where limited space installations are needed. Towers can be set up for very custom look or for high volume location needs. 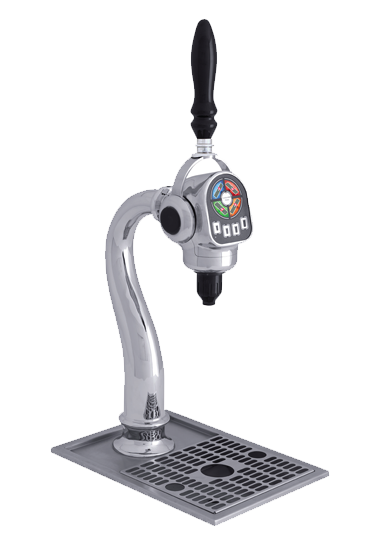 However, they are most commonly used and connected to serve teas and non carbonated drinks and sit along side of a main serving station since non-carbonated drink do not require chilling or refrigeration. When Towers are used for dispensing sodas, pre-chillers and remote refrigeration systems for dispensing premium carbonated soda flavors can be used, such as in McDonald’s restaurants.